POMPEY paid out £268,715 to agents in the past year. The figures, published by the Football League, show the Blues paid out nearly double that of the nearest League Two side in the period October 1, 2014, to September 30, 2015. It’s a significant leap from the £74,960 paid out between 2013 and 2014 by the Fratton Park club. Wigan (£1,461,088) and Millwall (£297,850) were the only League One sides to exceed Pompey’s figure. There were also four Championship sides who paid out less in the same period. Rotherham United (£185,430) Preston (£194,961), Bristol City (£231,316) and Ipswich (£261,347) all came in under Pompey’s figure. The Blues’ agent payments represent over a quarter of the total of £1,007,920 paid out by League Two clubs. The £268,715 figure is nearly double the nearest club in the fourth tier. 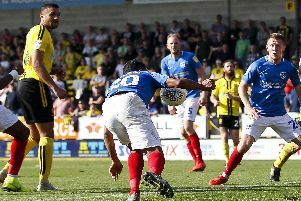 Leyton Orient stumped up over £136,642 over the same period as Pompey. The third-highest figure among League Two sides came from Notts County (£71,086), who were relegated from the third tier. Manager Paul Cook has recruited 18 players since arriving at Fratton Park from Chesterfield in the summer. Accrington Stanley did not shell out a single penny on agent fees in League Two, and it was a similar story for Bury in League One. A total of £3,167,964 was paid out by sides in League One, with Wigan paying the most. Championship sides paid a total of £26,124,044. Cardiff’s £2,828,133 figure topped that paid by Reading, QPR and Fulham. Premier League clubs paid over a whopping £130m to agents in the same period. Liverpool paid the most (£14,301,464) in front of Manchester United (£13,881,814) and Manchester City (£12,429,380). The amounts shown include payments made by clubs on behalf of players, with figures collected and provided by the FA.